Beka and her friends will face their greatest and most important challenge ever when the young heir to the kingdom vanishes. They will be sent out of Corus on a trail that appears and disappears, following a twisting road throughout Tortall. It will be her greatest Hunt—if she can survive the very powerful enemies who do not want her to succeed in her goal. As much as it pains me to say it, Mastiff was not the most enjoyable book to read. Those who have followed me for a while now know that I am in love with Tamora Pierce. 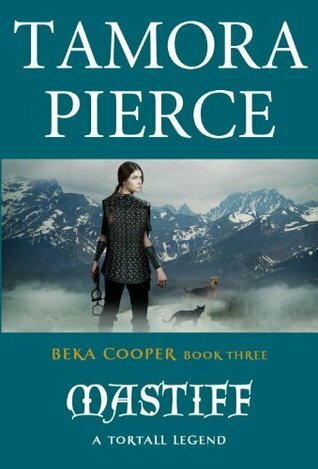 I have read everything she's ever written...multiple times...and normally all I have to say about her is great things and rave reviews...but the third and final book in the Beka Cooper Trilogy fell terribly flat when compared to all of Pierce's other amazing works. It wasn't...awful...there was a lot of mystery, intrigue, and a sprinkling of love...but there just wasn't the spark that I've come to expect from my Beka, Pounce, Goodwin, Tunstall and the lot! The first two books in the series were fantastic: full of overlapping plots, crazy twists, and characters that practically sprang off the page into your living room. The third book was more...mundane. There was only a single recurring plot that was driven into you the entire time. I found myself thinking "okay...I freaking get it already...the prince has been kidnapped and we have to get him back or the realm will crumble...gotcha..." There was also a lot more technicall mumbo-jumbo all about tracking and hunting for prey. There was some of that in the first books, but I felt like a large part of this book was a "how-to" of middle-ages police work. It was a really cool story, but there was no side story to keep things mysterious and interesting. There was a kind of love-interest side story, but it was very tame and not romantic at all so I was kind of sad by it instead of excited. Also, there were no really shocking twists, and worst of all almost no character development. Sure, we get to see some characters that we love (Tunstall, Lady Sabine, Pounce, Achoo, etc) but those who were absent left a gaping hole. Rosto, Kora, Aniki, Goodwin, Beka's family, and the rest of her Kennel are all missing and I want to know what happened to them if this is the last book in the series! Not to mention, Tunstall acts entirely out of character from the last two books. I would be okay with it if the personality change could be explained away by some disaster happening, or some significant event that caused him to act differently, but there was nothing. It's like the Tunstall from book 1 and the Tunstall from book 3 are entirely different characters...and nothing explains the change.I can't decide if I feel like I've been lied to the entire series or if he just grew....evil...regardless, I felt like I didn't even know a character that I have come to love and depend on for the last two books so I was really upset by the ending. Thank you, I thought I had missed something regarding Tunstall. It just wasn't believeable that he would go turncloak like that after a dinner and a little bribe. I found Farmer cute throughout but found the romance just jumped out of nowhere. But I agree, poor Rosto! Him, Aniki and Kora needed more coverage in the books, after having been built up so well in the first book and referenced throughout the rest of the series.